St. Mary Abchurch was founded in the 12th Century and previously known as St. Mary Upchurch. Although the 16th Century Antiquarian John Stow tells us that it was a ‘Fair Church’, St. Mary’s is of far greater significance today than the pre-fire building he describes. 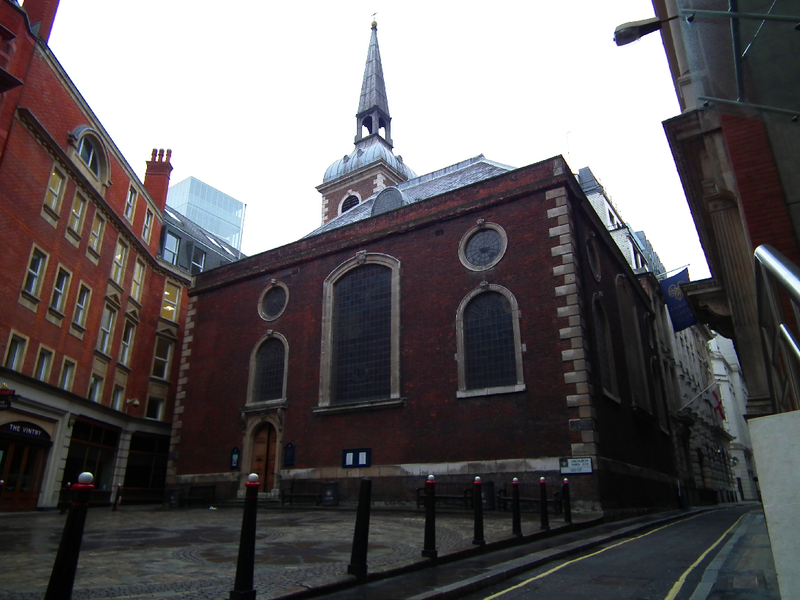 Possibly the finest original interior of any Wren church, it was rebuilt in red brick at a cost of £ 4922 by Mason Christopher Kempster, from 1681-6. 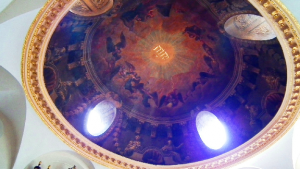 Deceptively large inside, St. Mary’s is crowned by a magnificent Dome. The Dome, some forty feet across, was painted by parishioner William Snow and completed in 1708. Snow’s superb artwork depicts the Worship of Heaven. Christopher Wren assembled some of the most accomplished craftsmen of the day to work on St. Mary’s. This is probably best illustrated by Grinling Gibbons’ Wood Carving, possibly his finest work in a city church. The impressive large canopied Pulpit is the work of William Grey in 1685. The slender lead covered Spire stands 51 ft high, and was once topped with a Copper Weather Vane by Robert Bird. Bird famously contributed the Flaming Orb on top of the ‘Monument’ to the Fire of London. The Weather Vane is now above the North door. St. Mary’s suffered extensive bomb damage in 1940, it’s most treasured items, Gibbons’ reredos and the domed roof were damaged seemingly beyond repair. Years of painstaking reconstruction by Godfrey Allen* followed, leaving the church looking just as Wren would have known it. 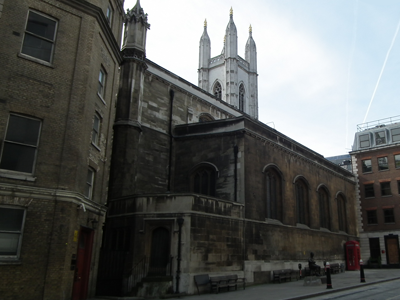 St. Mary’s is no longer a parish church, becoming a Guild Church as a result of the ‘City of London Guild Churches act, 1952’. The Church subsequently became part of the parish of St. Stephen Walbrook. 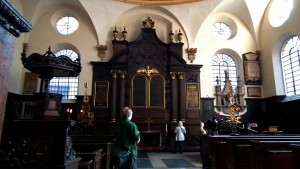 St. Mary Abchurch should be high on anyone’s list wishing to discover Christopher Wren in the City. *Godfrey Allen, architect and surveyor to St. Paul’s Cathedral was no stranger to restoring Wren’s work, having worked on the Sheldonian Theatre, Oxford (1956-63) and several post-war City of London churches.